Infinity® Skybox™ is a premium product that heightens the already visually stunning Infinity® U23 cabinet with the addition of an integrated 55” vertical monitor. 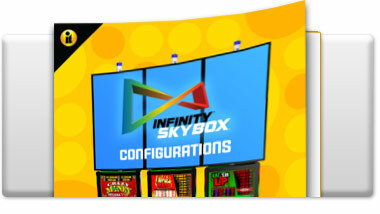 Infinity Skybox was created with casino operators in mind as the cabinet utilizes a modular design leveraging IT’s patent-pending Simple Sign Display Kit™ technology to secure the display. 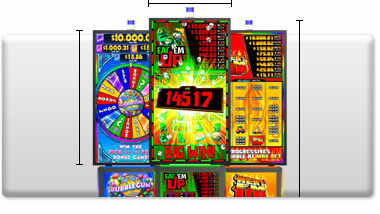 The signage is comfortable to the player sitting directly under it and can also be seen from patrons across the casino floor as exciting bonus events and progressive meters are brightly displayed. The flexibility of the Infinity Skybox is ideal as stand-alone or in a large bank format with linked progressives and can be simply converted to core IT content. Infinity Skybox launches with two flagship titles. 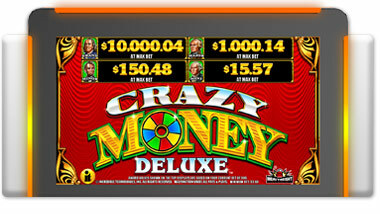 Crazy Money® Deluxe™ and Money Rain® Deluxe™ debut an impactful new twist of the company’s most popular game brands, Crazy Money® and Money Rain®. 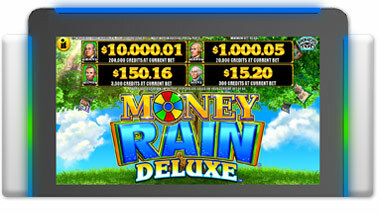 Both titles feature all of the gameplay that players have come to love, with the addition of a massive digital bonus wheel overhead and a linkable progressive jackpot display.